Harry Potter and the Cursed Child – A fabulous fantasy, Hogwarts and all! - Like millions and millions of us, you love the adventures of the inimitable Harry Potter. J. K Rowling's marvellous books have been translated into almost eighty different languages and have sold more than 450 million copies right across our lovely blue planet. Mention Harry Potter in China, South America, Alaska... you name it, the people there will know exactly who you're talking about. Now Harry's due to set the stage on fire in London's glittering West End. A splendidly ornate brick confection of a building, the Palace Theatre is full of visual delights inside too, with plush scarlet seating, sculptures of cherubs adorning every level of seating and an amazing revolving stage. Starting its long and illustrious life as the English Opera House, this beautiful theatre was designed by Richard D’Oyly Carte in partnership with the architects T E Collcut and G H Holloway. It first opened its doors way back in 1891 with an inaugural performance of the play Ivanhoe. By 1892 it had changed its name to the Palace Theatre of Varieties and became home to some of the era’s finest variety shows and also acted as a cinema, screening international news and showing the famous film In Birdland in 1907, the first ever wildlife film shown to a paying audience. From 1904 the theatre’s new manager brought in a series of innovative and experimental acts including scandalously bare-legged dancers and grand piano concerts. They staged music in the intervals via a live orchestra and played host to the first Royal Variety Performance in 1912. In the ‘20s the Palace Theatre grew in popularity as a venue for musicals, showing the famous No No Nanette, and a Broadway musical by the Marx Brothers, during 1922. Like many London theatres, the Palace closed during the First and Second World War, with severe bomb damage in WW2. Despite this, they managed to show a popular revival of Oscar Asche’s Chu Chin Chow between 1940 and 1941, returning after the war to show a wide variety of entertainment from shows to plays, cabarets to pantomimes. In 1961 they hit gold with the stage version of The Sound of Music, whose 2,385 performances thrilled audiences for years. In 1985 the Palace Theatre enjoyed a well-earned facelift, revealing the gorgeous original marble walls that had been covered with layers and payers of paint. Today the Palace Theatre is owned by Sir Andrew Lloyd Webber’s Really Useful Group Limited. The balcony is unusually high and extremely steep, good to bear in mind if you have restricted mobility or are simply scared of heights. Spooky goings on at the Palace Theatre! The Palace Theatre is haunted by no less than two ghosts, an unknown ballerina and the famous actor Ivor Novello, who apparently watches performances from the magnificent Dress Circle. In 1968 Dame Judi Dench starred in Cabaret. Jesus Christ Superstar took up residency there for eight years in the ‘70s, and Les Misérables ran for a whopping 19 years from 1985 before transferring to Queen’s Theatre. Recent productions include Spamalot and Priscilla and Queen of the Desert. 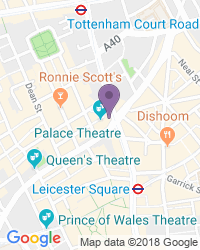 You’ll find wheelchair access through a side exit on Shaftesbury Avenue, there’s an infra-red system with headsets and staff are always pleased to help. We’re a top destination for a wide variety of seat types and prices, with excellent availability on the full range of Palace Theatre tickets.